My grandmother died a few weeks ago. She was 99 years old. 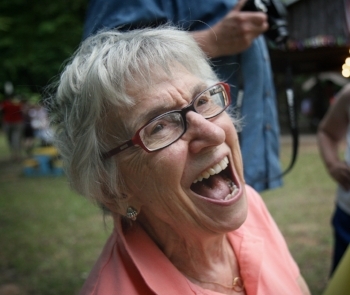 For most of her life, she was filled with such a dynamic vitality and heartfelt joy for living that it seemed like she might just live forever. But she did not. She died, as we all will. And so I come into a time of grief. A time of standing in my closet frozen in place unable to choose what to wear. A time of forgetting how to cook my breakfast. A time of resting my torso out over my kitchen counter because I can’t figure out how to make dinner for four people while holding for the heaviness of this sadness. Grief is such a heavy emotion. The impulse is to turn away. To try to sweep it under the rug and act “fine” as I have often done through my life. But turning away from the truth of my emotions is not the trajectory my life is on anymore. My work now is to turn towards. What I find when I turn toward grief and let it do what it must is this: Grief is a heart opening as well. With all the talk of Love, Joy, Compassion, Gratitude as ways to open the heart - leaning into grief doesn’t get much attention. That is an oversight in my opinion. NOTHING OPENS MY HEART THE WAY WAVES OF GRIEF OPEN ME. It reminds me how much I loved and continue to love my Gigi. It reminds me how precious is this Life. It reminds me of my connectedness to my family who are also grieving, and to the bigger human family. It gives me such compassion for those I know who’ve also had death come near. Though it is very uncomfortable, and not what I would choose in a million years for myself or any others I keep leaning in to this grief. It is rightful. May it do it’s healing work and remind me once again that we are all here to Love and Love well.